Quantity: 5 colours, red, baby blue, yellow, green, orange, 4 pieces per colour, 20 pieces paper party favor bags with handles all together for each package, enough for party favour bags or craft projects. Design your bags: decorate these paper bags with embellishments, to fit your party theme, make them special. Material: made of 120gsm craft paper, pretty strong for goodies as party bags, with bright and vibrant colour, colourful and lovely. 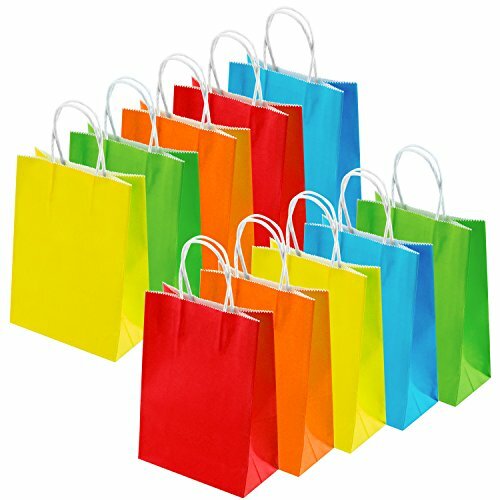 Multiple uses: party favor bags for birthday party, bachelorette party, wedding, baby shower, Easter egg hunt, as bridal shower gift bags, grab bags, great for craft projects. Dimensions: Each bag measures 16cm/6.3 inches x 8cm/3.15 inches x 22cm/8.66 inches (Length x Width x Height), the height does not include handle. Good size to hold little toys, biscuits, candies, cake pops etc.